This is a comprehensive guide to manage your VMware Virtual SAN with the Ruby vSphere Console. RVC is an interactive command line tool to control your platform. If you are new to RVC, make sure to read the Getting Started with Ruby vSphere Console Guide. All commands are from the latest vSphere 5.5 Update2 release. Consumes all eligible disks on a host. When you have multiple SSDs you can specify the appropriate SSD by its model. Gathers and checks various VSAN related counters like components or disk utilization against their limits. This command can be used against a single ESXi host or a Cluster. Simulates how host failures would impact VSAN resource usage. The command shows the current VSAN disk usage and the calculated disk usage after a host has failed. The simulation assumes that all objects would be brought back to full policy compliance by bringing up new mirrors of existing data. compliance by bringing up new mirrors of existing data. if a host failure would drive the cluster to being close to full. Put the host into maintenance mode. This command is VSAN aware and can migrate VSAN data to other host like the vSphere Web Client does. It also migrates running virtual machines when DRS is enabled. timeout, -t: Set a timoute for the process to complete. When the host can not enter maintenance mode in X seconds, the process is canceled. evacuate-powered-off-vms, -e: Moves powered off virtual machines to other hosts in the cluster. no-wait, -n: The command returns immediately without waiting for the task to complete. This command shows what happens when a mirror resync is in progress. If a host fails or is going into maintenance mode, you should watch the resync status here. The command can be run once or with an refresh interval. The -c option is deprecated, the number of components is displayed by default. The value displayed with the -s option is an assumption about the drives maximum possible iops. The -i parameter displays additional information about the physical usage (physUsage) from objects. What we see here is a virtual machine with one virtual disk. That are 2 DOM Objects - The Namespace directory and the virtual disk. A powerful command to find objects and detailed object information. Can be used against hosts or clusters. Usage against clusters is recommended to resolve UUID into readable names. --type, -t <s>: CMMDS type, e.g. DOM_OBJECT, LSOM_OBJECT, POLICY, DISK etc. --uuid, -u <s>: UUID of the entry. --owner, -o <s>: UUID of the owning node. Prints all objects that are located on a physical disk. This command helps during troubleshooting when you want to identify all objects on a physical disk. You have to know the disk UUID which can be identified with the vsan.cmmds_find command. Prints informations about physical location and configuration from objects. The command output is very similar to the vsan.vm_object_info but it is used against a single object. Example 1 - Change the disk policy to tolerate 2 host failures. Displays read cache and capacity stats for vmdks. Print read cache and capacity stats for vmdks. Provides information about objects and their health status. With this command, you can identify that all object components are healthy, which means that witness and all mirrors are available and synced. It also identifies possibly orphaned objects. Print component status for objects in the cluster. all comps on a given host were healthy. Example 1 - Simple component status histogram. We can see 45 objects with 3/3 healthy components and 23 objects with 7/7 healthy components. With default policies, 3/3 are disks (2 mirror+witness) and 7/7 are namespace directories. We can also see an orphand object in this example. Example 2 - Add a table with all object and their status to the command output. That output reveals which object actually is orphaned. Checks state of VMs and VSAN objects. This command can also re-register vms where objects are out of sync. I can't reproduce to get VMs out of sync, so I couldn't test that for now. I am going to update that post when i have any further information. This command fixes virtual machines that are renamed by the vCenter in case of storage inaccessibility when they are get renamed to their vmx file path. It is a best effort command, as the real VM name is unknown. Re-enables VSAN on vmk ports. Could be useful when you have network configuration problems in your VSAN Cluster. Example 2 - Display all VM objects performance stats with an interval of 5. Clears cached disk informations. $disksCache is an internal variable. Usually, this command is not required. If you encounter problems it might help. Displays the mapping between physical network interface and physical switchs by using using Link Layer Discovery Protocol (LLDP). This command recovers Storage Policy Based Management associations. Basics All commands can be configured with an Interval in which Observer will collect stats and a maximum runtime. Default is to collect stats each 60 seconds and run 2 hours. Keep in mind that VSAN Observer runs from memory when adjusting runtime settings. Options to change the default settings for runtime and interval are -i and -m.
--generate-html-bundle, -g <s>: Generates an HTML bundle after completion. --max-runtime, -m <i>: Maximum number of hours to collect stats. --no-https, -n: Don't use HTTPS and don't require login. VSAN Observer queries stats from each ESXi host in the JSON format. That output can be written to a file to be used by other tools. In each collection interval, stats are gathered from all hosts and written to a new line. This view shows VSAN statistics from the view point of the host. The view represents the performance as seen by VMs running on the hosts for which statistics are shown. You should see balanced statistics in that view. To balance the workload you can try to use vMotion to move VMs to other ESXi hosts in the Cluster. This might help, but does not always solve the problem because the performance issue can be caused by any disk on any host in the VSAN cluster. This view shows aggregated statistics from all disks in an host. This might help to identify the ESXi host which causes contention. This view shows detailed information about physical disks on each host. This allows to further identify when single disks are causing contention. 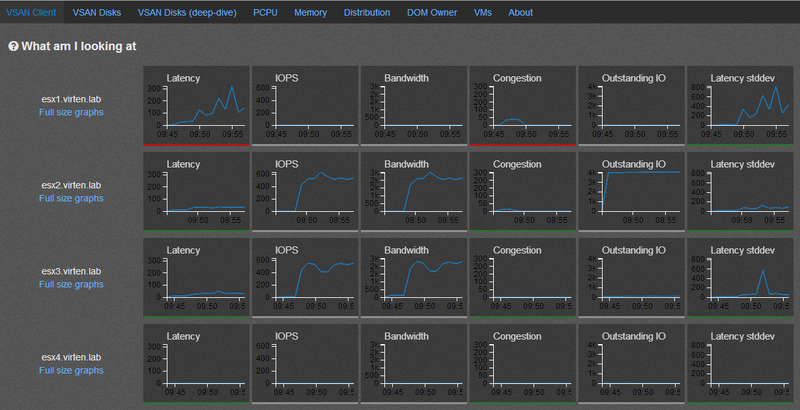 You can view latency and IOPS from all disks (SSD and MD) and special metrics like RC Hit rate and WriteBuffer load. This view allows to analyse single VMs. You can drill down each virtual disk and see where it is physically located. You can see objects and components performance metrics. I noticed after removing a disk group from a host and re-adding it back, it now has N/A for the DisplayName and Host column; when running vsan.disks_stats I was instructed by VMware support to do this, due to invalid components. It did clean up the error, but I now have N/A for Displayname and Host. VSAN seems to be in good standing. Is there a way to add this information back for the vsan.disks_stats cmd? Thanks.